Illustrations Ready to be Judged. 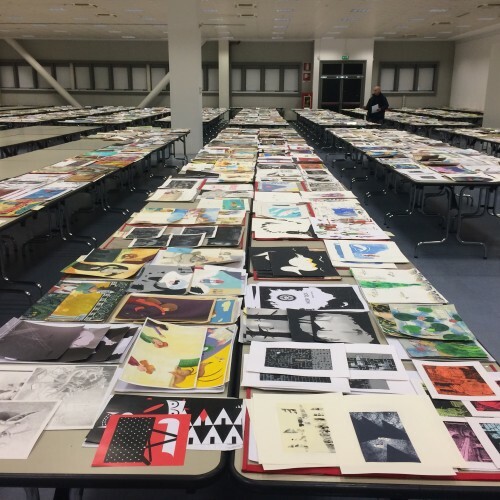 Charles Kim, Associate Publisher at MoMA, describes what it is like to judge 15,000 illustrations for the prestigious Bologna Illustrators Exhibition in just a few days. 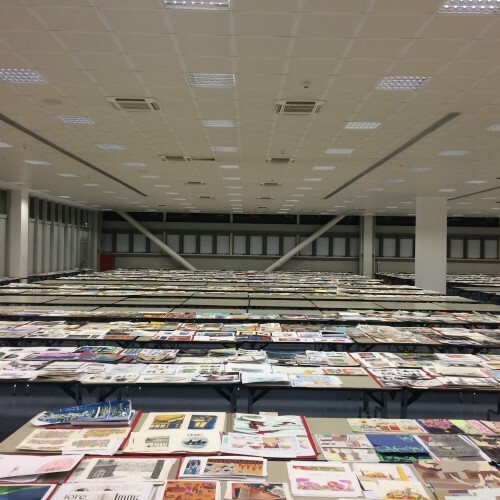 Each year, the Bologna Children’s Book Fair, the largest fair in the world for children’s books, hosts a highly competitive Illustrators Exhibition. More than 3,000 professional and amateur illustrators from sixty-two countries send in their art for consideration. A five-person jury, typically a mix of illustrators, academics, publishers, and editors, selects seventy-five to eighty artists to include in the exhibition, the main event of the fair. This year’s jury members were Ulla Rhedin, a Swedish academic and specialist of picture books; widely published illustrators Svetlan Junakovic, of Croatia, and Benjamin Chaud, of France; Paola Parazzoli, an editor at Rizzoli Children’s in Milan; and myself. On January 11, we arrived in Bologna for a three-and-a-half-day marathon of seeing, debating, and selecting. Bologna’s culinary strengths and traditions are well known throughout Italy, and on the first night, our hosts—Illustrators Exhibition managers Roberta Chinni, Beatrice Monetti, and Runa Bignami—took us to a terrific local restaurant. The food and wine were superb, and we stayed out late, getting to know each other and discussing our criteria for selecting the artists. Ushered the next morning at 9 into Hall 18 of the Bologna Fiere, we entered a massive, open room filled with long tables lined end to end. On them sat paintings and drawings of every kind and in all media, laid out in one large room. Thousands of submissions sat in tidy piles, each hoping to stand out, to impress a judge, to be selected for the big show. I had never seen 15,000 original works on paper at once, and panicked slightly. I wasn’t the only juror to do so. But the exhibition managers, well versed in the art of dividing and conquering, had sorted the works into very helpful categories, such as the country of the submitting artist, or whether the artist was previously published or unpublished. Submissions made by art schools and publishers on behalf of their artists occupied separate areas on one side of the room. Ulla is a literary scholar, professor, and lecturer, and a former jury member of the Astrid Lindgren Memorial Award, the Nobel of children’s books. She was looking for artists who could tell a story and push the boundaries of visual storytelling. Benjamin and Svetlan, both of whom possess extensive knowledge of the styles and methods of their fellow illustrators, sought originality, proper composition, and a deft, original hand. As an editor in charge of producing over a dozen books a year for a prestigious Italian imprint, Paola was on the lookout for talented artists to introduce to a large audience. I was simply looking for art that moved me. I wanted to be wowed by masterful lines and gorgeous colors. I hoped to find artists who could convey emotion and humor to children, or express ideas clearly and inventively in ways I had yet to see in children’s books. We jurors spent some time on our own at the beginning, winding our way among the tables, absorbing the onslaught of color, form, and line. Then, as a group, we selected artists who would make it into the second round, from which the final exhibition artists would be chosen. The jury made it through about 1,300 entries on the first day. We reached consensus quickly on most of the works, with occasional debates on the merits or weaknesses of an individual entrant. We looked at all five works submitted by every single illustrator. Each juror’s opinion held equal weight. As the jury members began to go through each submission, pile by pile, table by table, a dazzling menagerie of animals and fantastical creatures jumped off the pages. Children and adults of all ages laughed, sang, cried, played, and slept in landscapes and buildings and interiors from all over the world. There were monsters and emperors and penguins, and several hundred bears, no two of them looking exactly alike. There were an unseemly number of cats, dogs, and owls, none of which remotely resembled each other either. I had expected to see a wildly diverse group of illustrations, but I wasn’t prepared for the sheer individuality and uniqueness of the art. But the coin had a flip side. The competition is open to anyone around the world who wants to apply, and like American Idol, many contestants weren’t fully aware of the limits of their talents. But the most common fault we could see was the lack of originality. Hundreds of very skilled artists were rejected because their work seemed too derivative to us. There were many excellent copies of Jean-Jacques Sempé, Saul Steinberg, Hayao Miyazaki, Maurice Sendak, Kitty Crowther—but they were copies nevertheless, treading on well-traveled ground. Very few of the artists received a unanimous vote; most received no votes. Many only received one, but in several of those instances, the lone juror was able to convince the four others of the quality he or she saw. Many of the artists who made it into the final exhibition selection did so because a single juror fought for their work in the first round. Still others had four votes on their side, only to have one juror argue persuasively against their inclusion in the show. After another lovely dinner filled with incredible food and an easy camaraderie, we didn’t make it back to the hotel until after 11:30. As we walked back from the restaurant, I looked up and was surprised to see lots of stars. In New York, you don’t see many, even on a clear night. Bologna is a modest and pretty city, and it has a special charm at night. On the second day, we paused from our task to speak for nearly an hour with a group of about twenty-five graduate students in illustration from Milan. We were told that a couple of them had submitted their work for consideration; we never found out who. Even with the break, we managed to judge over 1,700 entries on day two. Again, we looked at all five works from each contestant. I’m not certain how we were able to do this, but after two days, we had whittled the 3,000 artists to 166 finalists…At times, we spent nearly an hour discussing whether an artist deserved to move forward, and why. At the start of day three, the jury members intentionally slowed down the process of reviewing the portfolios remaining. We were tired; and the hardest work lay ahead of us. Until then we had moved largely as a group, moving from table to table and coming to consensus on the artists to choose for the final round. Now we reviewed each of the 166 artists on our own, voting for our favorites using color-coded Post-Its. When we were done, we gathered again to look at each finalist one by one. The artists who had received four or five votes were automatically selected for the exhibition; but only two dozen of them had earned that distinction. We debated at length the fate of the 140 or so others. Ultimately, the winning entrants showed a combination of freshness, a distinctive voice or point of view, and, most important, the ability to tell a compelling story using just five images. Technique often took a back seat to inventiveness; a perfectly realistic face or building was no match for a quirky, original world, hatched in a creative mind. The Illustrators Exhibition managers never once told us what to do or what to select. Since they are Italians who manage an exhibition competition in Italy, it stands to reason that they might suggest that we choose more of their countrymen. They could have asked us to favor best-selling or well-known illustrators, or those coming from the largest markets, to help them market and publicize the exhibition. Instead, they stayed incredibly impartial and professional from start to finish, giving us help when we needed and avoiding any whiff of impropriety. Having asked us to be the jurors, they left us alone to do what they had asked us to do: select the artists. And that’s what we did: We chose seventy-six winners, who come from twenty-two countries on four continents. Several of them are widely published; many more have just started their careers or never been published. The veteran illustrators selected have proven that they still got it, while the newer talents are proof that the field of children’s books is a dynamic one, with a steady supply of artists dreaming of a chance to introduce children to a world that resides, for now at least, in their imagination. 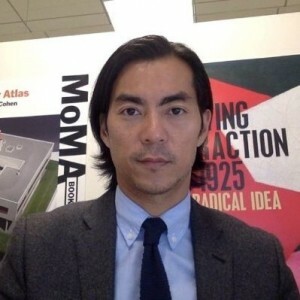 Charles Kim is the Associate Publisher at the Museum of Modern Art in New York City.